With the temperatures expected to rise this weekend, we thought it prudent to send a reminder of FNSW Heat Policy (see attached, and refer to the links provided in the policy document for further prudent information). These are the maximum cancellation temperatures. Cancellation of games, training or events at lower temperatures may be necessary depending on factors such as: humidity; local conditions including radiant heat from synthetic surfaces and lack of ventilation at indoor centres; player wellbeing; and player acclimatisation. For the purpose of this policy a child is a person aged up to and including 16 years of age. Note that young children are especially at risk in the heat and should not be forced to continue playing or training if they appear distressed or complain about feeling unwell. We all have a duty of care in relation to the heat, and we need to make every effort to ensure the safety and well-being of our players, officials and committees etc. - personal liability claims could be an issue if it is found that we have not undertaken prudent steps to follow the heat policy guidelines and recommendations in the event of a major heat related death or major incident. Your Club supports the Heat Policy and will enforce it if required at any time. 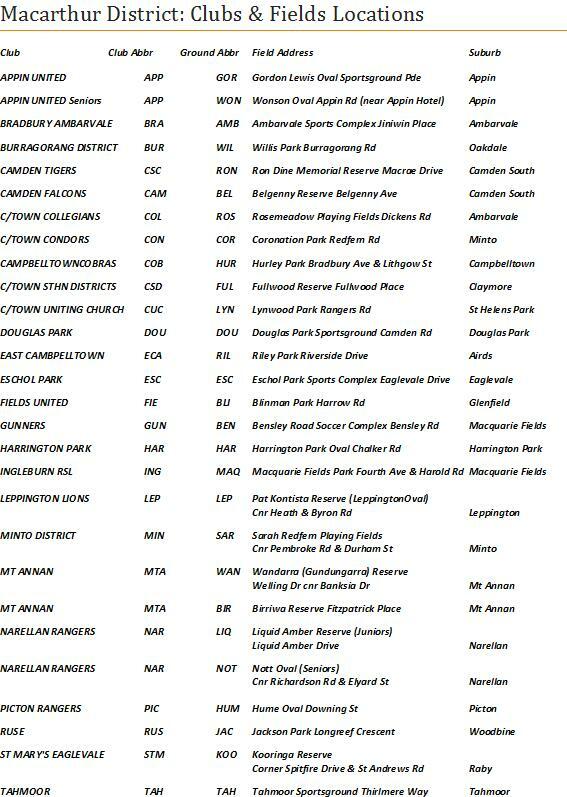 The Game Day Match report is required to be completed for each game (including forfeits / wash outs) and lodged at the club (St Marys), with match fees, no later than 1 week after match day. 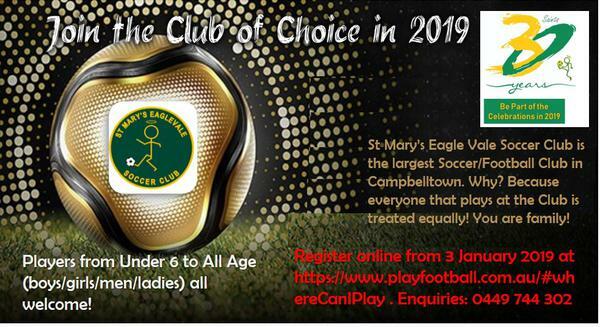 2019 Registrations to play football with St Mary's Eagle Vale Soccer Club will be available online at the Play Football website from 3 January 2019. The pay online option will not be available until 1 February 2019 to allow for players to secure their Active Kids voucher (see below), which will in most cases, covers the full cost of the junior player's registration (the Govt will make these vouchers available via online application from 1 Feb 2019). NSW ACTIVE KIDS PROGRAM - $100 REBATE TO ALL CHILDREN UNDER 18YO. Over the next four years, the NSW government will be allocating an annual $100 rebate (to every child who is enrolled in school and is aged under 18 years), towards their participation in sporting activities. 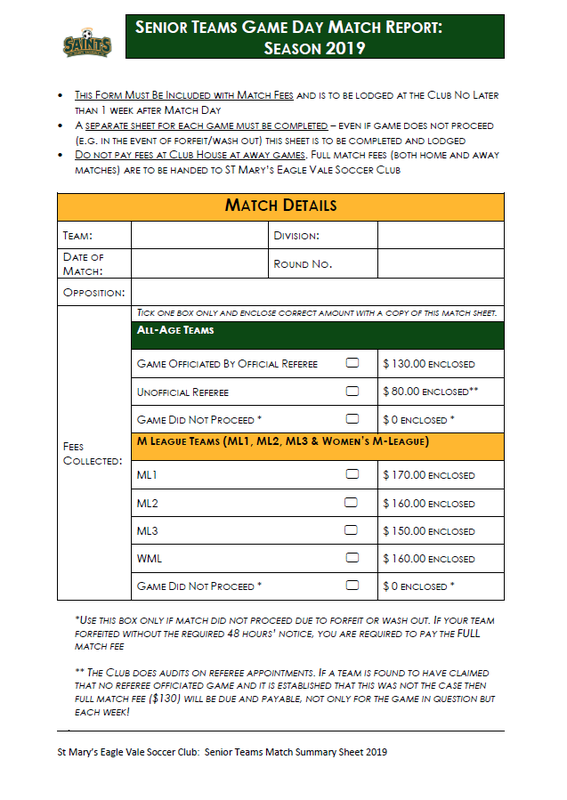 This means that you can apply for the rebate, and use the $100 towards registration costs, which in a lot of cases will mean that you will not need to physically pay for registering to play at St Mary's Eagle Vale Soccer Club in 2018 (or worse case, pay only a nominal balance)! How good is that! Register to play football at St Mary's Eagle Soccer Club basically for free in 2018 thanks to the NSW Government! 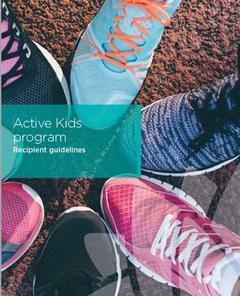 Important Information: Click here to access the Registration Guide Support Document which will guide you through the registration process to ensure you don't miss out on accessing the NSW Active Kids rebate. IMPORTANT NOTE – The rebate does not come into play until 31 January 2018, however to secure your spot at the Club, you can register to play via the online registration program from 3 January 2018, hold off on online payment, and apply your voucher code when you receive it to complete your registration! Players may play for another team of their club other than the team for which they are registered with only in the following circumstances. Coach’s cannot leave the technical area (except when called onto field by Ref to attend to an injured player. (Coach/Manager/Players all must remain in Technical Area). Just a reminder that no spectators/parents are allowed in or around the technical area – They must remain behind the spectator line. U12 and up - Coaches are to wear their Coach ID card on lanyard on them. The front page of match cards should be completed by the home club and the Match card made available to both teams prior to the start of the match. Match cards can normally be found near the home teams canteen. It is then each teams manager's responsibility to fill in their players details and return the card prior to the start of the match. 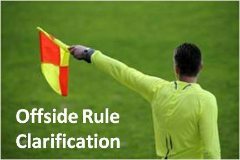 Referee Fee's are required to be collected for both home and away games. In 2019 teams are not required to pay for referees at away venues. 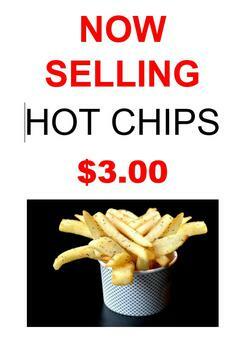 Full match payment for away games (inclusive of the referee fee) is to be handed in at the Kooringa Canteen the following home game at the latest. The Coach & Manager Handbook will give you details about Match Fees to borrowed players, from Yellow Cards to Hot Weather Policy, it covers information about the club and local competition. A great read to keep in your Sunday morning library. When competing in an event, Gala Days or Non-Club or Non-Association Competitions this form should be completed and sent to St Marys Secretary, Tony Poulton, to have the game sanctioned. New to soccer and not sure how to get the kids to warm up, here's 142 pages of light reading to help you out. If you do a different one each week the kids will be about 83 by the time you finish them all. A document explaining how to provide skills to your player, includes exercises and warm ups.